6 make-up options for New Year's Eve. How do you want to put make-up water snake? Examples of make-up and description. Interesting video on the topic. Makeup - an integral part of a well-groomed femaleface. The right make-up is able to complement your image and make it complete, so your New Year's image can not be without such makeup. It is believed that the closest color for the black water snakes are the black. blue and green. In addition to these colors may be used in make-up brown notes and yellow, and redIf clothing has any item of the same color. Welcomes the use of brilliant shades and pencil, and rhinestones for a century. What is necessary: The main tool in the creation of this make-up will act as bright shade of pale emerald green or yellow-green. You can create a color that youlike mixing different shades of loose shadows, but remember that to create a wide-open eye reduction is necessary at the inner corner of the eye to apply the lighter shade, and a darker appearance. Then emphasize your eyes a pearlescent liquid eyeliner shades, ink, with, better to take the color of malachite. Very opportunely there will be false eyelashes of dark green or black color to create an ideal image of a fairy in the New Year's Eve. Lipstick makeup in this embodiment should be a neutral color. First, apply a tonal basis and can start the shadows. White shadow should be applied on all upper eyelid to brow. You can do it with your finger, blending with the border. Then take the gray shadows and apply only to the mobile part of a century at the top. Once applied both types of shadows can start to pencil technique. This will require a solid and sharp blackpencil. Using it on the outer corner of the eye is necessary to draw a thick line shtrishkami - arrow. When applying the strokes carefully memorize the technique with which you do it, otherwise not be able to achieve a very similar form in the second eye. Next, take the brush and blend thesepencil strokes, as if stretching out to the side. Along the edges of the eye above and below make the usual black arrows pencil, then on top of all of this very carefully put a black shadows, without violating the borders. 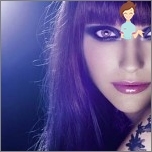 Complete the image, carefully paint over the lashes, or use false eyelashes to your choice. You will need: blue and dark brown shade of pearl and black eyeliner or pencil. On the upper movable eyelids, apply a dark shade of brown and white shadow on the bottom. Then proceed to the length of the arrow. Apply a light brown shade so that the tip of the arrow reached the end of the eyebrow. Then draw an arrow in the inner corners of the eyes, they should be extended. For a successful application, use a sharp pencil or eyeliner with a thin brush. And in the outer corners of the eye shadow Draw arrows arrows, but without reaching their end. Complete makeover richly colored, upper eyelids or overhead, it is not necessary to do an emphasis on the lower. This make-up is very good for the green-eyed and brown-eyed brunettes. Begin by drawing the basic foundations of a colorless shade. Draw the desired shape of a dark pencil or liquid eyeliner. Fill out your form in the blackest shadows and blend. 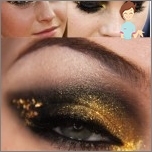 After that, apply a golden shade from mid-century to the inner corner of the eye. Next you will need gold foil for a century, it can be designed to polish. Tear small pieces and glue special glue to the eyelid from the outer corner of the eye. In the end, apply mascara on the lashes or use the patch, at your discretion. Emphasize your eyes eyeliner on top and bottom. Apply a white base under the shadow of all the upper eyelid to brow. Then the green shade from the outer corner to the middle of the century rolling stock. Next, apply a dark shade in the outer corner to the crease of the upper eyelid rolling. 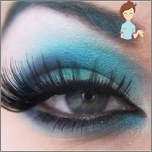 Climb just above the eyebrows and apply to it a dark shade of blue, even above the shade with a lighter shade of blue pearl or blue, from the outer to the inner corner and. Places transitions some shadows in the other, try to carefully shade, achieving smooth, imperceptible transition. The same shade apply under the lower lashes with a brush or applicator, you can use the pen with the same color. Lower eyelid move the black pencil, which then blend. Above the eyes also move, but without feathering. Nakraste eyelashes with black ink. Glue false eyelashes. In describing the makeup described little about the lips and eyebrows. For example, in general, that eyebrows should be in "full combat readiness." This means carefully plucked and highlights the color that suits your tsvetotipu or lightly shaded in the color of shadows, the shadows can be themselves. Well, the lips are not worth much to allocate, give this year preference Lipstick of pastel colors. Bright colors are possible only in the case of the purely black eye make-up. If you are going to make the best and most beautifulNew Year's make-up, remember that for any make-apa is necessary to use the tonal foundation or powdered, or as they are called - base. This assures you of its durability, allow to look your best, not only for New Year's Eve, but even during the day, if necessary. This is your happy holiday is not marred by anything and good mood will be your faithful companion! Read also, How to properly prepare yourself for the New Year, to be the most beautiful.